Dog rescues aren't necessarily common, but they typically follow the same pattern: loyal pets powering through cut-up paws until they can't go any further. Dogs are a common sight on the trails up to Summit County’s many peaks, but like humans, they sometimes bite off a little more than they can chew. That’s what happened Sunday night at around 5 p.m. on Quandary Peak, when a canine companion’s paws became too cut up to go on any further near the 14,265-foot summit. Luckily, the Summit County Rescue Group was able to get a three-person crew together that brought the dog down on a stretcher within about two hours. 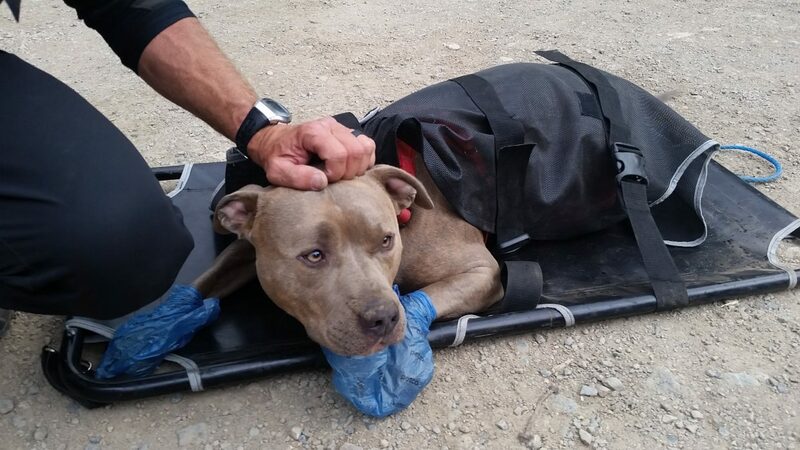 While such operations aren’t technically within the group’s purview, SCRG public information officer Charles Pitman said they have always been able to get a crew together to help injured dogs off of mountains — sometimes under harrowing circumstances. A couple of years ago, for instance, two rescuers had to empty their backpacks and put one dog in each before rappelling down a cliff face. Sunday night’s rescue was tamer, though. A pair of good Samaritans heard the dog’s owner call for help and carried the injured pet down part of the mountain. But at 65 pounds, it was heavy lift. The hikers enlisted the help of SCRG, which sent a team up the mountain with an animal litter provided by the Summit County Sheriff’s Office. The dog had deep lacerations on his paws but was expected to make a full recovery. Pitman said that dog rescues are most common on mountains like Quandary and Buffalo, where the tree line ends early and the rest of the climb is through rubble fields full of sharp rocks that can cut up dogs’ paws. Potentially making matters worse, dog owners often don’t realize how willing their pets are to keep going, even if they’re in pain.